Think back to the last time you visited a museum. Did you realize that you were walking through a three-dimensional version of the user experience you’re trying to create as a content marketer? Because that’s exactly what you were doing. I began my career as a content developer for museums and interpretive centers. When I entered the world of digital content, I immediately noticed the museum-esque references — such as content curation and content artifacts. The similarities did not end there. Museum designers work in multiple dimensions and on teams of multiple disciplines. Our goal is to create a full-body, memorable experience while telling a story. At its best, museum design is content-driven — we begin with the story we’re trying to tell and then imagine how to engage visitors with the story using interpretive panels, hands-on exhibits, virtual reality, audio-visual treatments, and computer games, to name a few. My museum experience has served me well since moving into the realm of digital content. No one cares more about the specifics of their content than museum curators, and they hold their content developers and exhibit designers to exacting standards. Telling stories in three or more dimensions and being programmed with principles of interpretation also keep me grounded in the goal of creating user-focused experiences when I work in the digital realm. I get tripped up on referring to users instead of visitors but, really, they’re the same, and as experience creators, our role is to serve them. 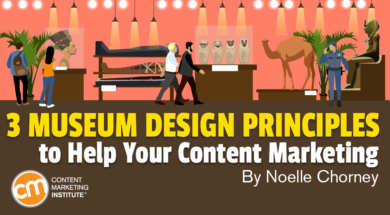 Here are three museum design principles that can easily be translated into the content marketing realm. Principle 1: If you don’t really know your audience, create a variety of experiences that appeal to a broad range of users. As a content marketer, you can count yourself lucky if you offer a good or service to a specific audience. Then working with personas and avatars makes sense and you can create meaningful custom content. But if you are trying to grow your business, attract new customers, or appeal to a wide audience, it’s more challenging, and in trying to focus on your ideal customer, you may unintentionally exclude potential customers you haven’t considered. As public institutions, museums are for everyone, but most museum professionals understand that not everyone has the same level of interest or engagement in the stories they’re trying to tell. We try to tell the story in layers that require different levels of commitment. Museum designers and content developers call it the “streaker, stroller, and studier” rule. Streakers blast through a space, glance at a few things, read the headlines, and head for the gift shop. Strollers spend a little more time on the areas that interest them, and see a hands-on exhibit through to its conclusion. Studiers are going to arrive well informed, dig into an area of interest, and read and explore all the content, down to the captions and exhibit labels. They may also point out errors or areas where they disagree. Marketers already consider the impact of appealing to all three types. Content marketers should consider doing so too. Consider labeling your content types according to the types of user they might appeal to: a tweet vs. a white paper, for example. Think about a range of time commitment, voice, and style in your effort to appeal to the broadest audience. Museum designers also spend a lot of time considering how to appeal to different learning styles. Whether you are creating experiences that will appeal to as many learning styles as possible, or whether you can identify how your audience fits into one particular learning style, you may gain another angle from which to create meaningful content. Principle 2: Engagement is optional, so know your “big idea” and reinforce it relentlessly. One of museums’ reasons for being, besides preserving historical information and artifacts, is educating the public. But the public isn’t always interested in being educated. Knowing your why and making sure every message that comes out of your institution supports that message will help to ensure that even the most disengaged visitor leaves with an inkling of what you do and why you matter. A well-run museum or interpretive center is organized around a solid strategic foundation. The administration has put time and effort into defining the vision, mission, communications goals, key messages, and measureable learning outcomes. One of the first questions I ask a new museum client is, “If a visitor goes through your new exhibit and can articulate only one thing they’ve learned when they leave, what would that thing be?” If you can answer that question, you know your “big idea” and can shape your communications to support it. Knowing that made my work in developing content for exhibits much simpler, and it struck me how little divide there was between my exhibit writing and marketing content for the office of government relations. What else is marketing but shameless promotion of any given topic? Particularly when you’re promoting and educating at the same time. That doesn’t mean every piece of content says the same thing. It just means that if you were to trace the meaning and intent behind all of it, there should be no break in logic, and certainly no conflict, between it and the big idea. Principle 3: Once you earn it, take your role as trusted adviser seriously. Museum curators come with a level of authority that content marketers aspire to. These scholars devote their lives to studying the minutiae of their areas of specialty and preserving those artifacts in service to society. They can’t wait to share what they know with anyone who will listen. They aren’t always able to share the information in a way that engages their visitors, but there is no doubt in visitors’ minds that they are the expert on their area of research. There also is no doubt in the visitors’ minds that these experts are sharing solely from a place of passion for their subject matter. As content marketers, it’s important to remember that the content is what serves your customers and the marketing is what serves your organization. While marketing is directly tied to sales and the bottom line, the more genuine your willingness to share information (like the museum curator) and the more generous you are with that information (like the museum itself), sharing for free or at least affordably, the closer you can come to the trusted adviser status that museums enjoy. You can’t pretend your way to the role of trusted adviser. It requires a depth of knowledge and a commitment to authenticity. It is a long-term commitment that won’t always show results immediately. Many museum members begin their relationship with the museum as children on school trips, and mature into committed patrons. You too will be attracting and cultivating your followers over time. Put the love and care in your story. Know what you want to share. Shamelessly promote with enthusiasm and an eagerness to be of service. Believe in what you’re saying. Say it in ways that pique interest, even in those who might not think they care. That, my friends, is what creates a memorable experience and a relationship with your followers. Want more insights on how to think about your content marketing and how to grow your success? Subscribe to the free daily CMI newsletter or the weekly digest with an exclusive perspective from founder Joe Pulizzi.